Flights over remote parts of Scotland have resumed following disruption caused by a fresh cloud of volcanic ash from Iceland. The UK Civil Aviation Authority (CAA) shut the airspace over the Hebrides at 1800 BST on Monday but reopened shortly after 1300 BST. Parts of Northern Ireland and the Republic of Ireland were also affected. The Met Office has warned of the possibility of more ash drifting over parts of Scotland later. The CAA said amounts of ash in the atmosphere had declined to levels where engine manufacturers agreed flight operations were safe, allowing the airspace to be reopened. Air traffic control body Nats said there would be a small no-fly zone in the northwest corner of UK airspace, but this was unlikely to have an impact on flights. Flights to and from the west coast islands of Tiree, Islay, Barra and Benbecula, and Campbeltown on the Kintyre peninsula, were suspended earlier. On its website, Highlands and Islands Airports Limited (HIAL) said all its airports were open for business and all flights to and from the islands would resume from 1300 BST. HIAL urged travellers to check with airlines for the latest information on arrivals and departures. Airline Loganair said four of its services between Glasgow and Islay and Campbeltown were cancelled earlier, but flights from Glasgow to Benbecula, Tiree and Stornoway could resume later. 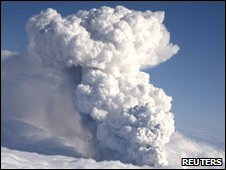 Last month, tens of thousands of Britons faced delays or were stranded abroad when a large part of European airspace was closed by the eruption of Iceland's Eyjafjallajokull volcano. Q&A: How long will cloud last?